After two weeks of intense sporting action, it’s now time to bring the curtains down on the XIX Commonwealth Games 2010 Delhi. We have witnessed records being broken, seen new stars emerge, and watched as the Friendly Games brought athletes, officials, and spectators from 71 nations together in a celebration that transcended all man-made boundaries. The agony and ecstasy of human endeavour has never been so beautifully represented as in top-level sport and as the Games draw to a close, it’s once again time to salute the triumph of human spirit that was on display at Delhi 2010. And what better way to do that than by showcasing host nation India’s unique blend of modernity and tradition? The audience can, as at the Opening Ceremony, expect to be treated to an experience of a lifetime. Laser shows, cultural performances, military bands and traditional martial arts will all combine to create a show that is guaranteed to thrill. 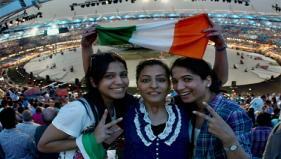 Of course, Delhi 2010 might be coming to a close, but the Commonwealth Games will carry on. As India bids adieu to our cherished guests, the spotlight moves to Glasgow, the hosts of the 2014 Games, who have prepared a special segment to give the world a glimpse of what to expect. See you all at the Closing Ceremony on Thursday, 14 October 2010. Get ready for a stunning end to the spectacular Games!